The Scarborough Maritime Heritage Centre was given, by Mrs Wardman, a lovely pair of locally made old leather sea-boots. For retired local fisherman, Allan Roberts, they brought back memories of working for the business that made them in the 1950/60s. 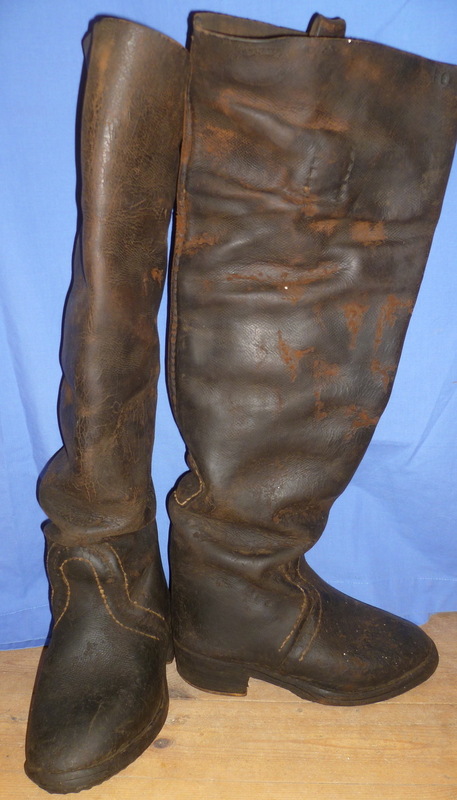 He was surprised to find that the boots were dated as being made in April 1955, the year before he started his working life, at T. Beanland and Sons in North Street, Scarborough. 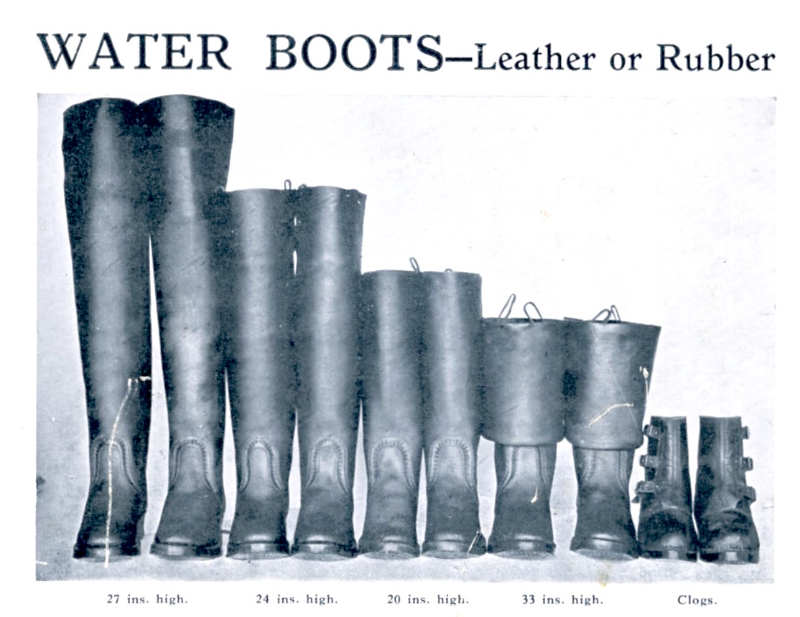 Although the fishing industry had largely turned to rubber boots by the 1930s, Beanlands were still producing leather sea-boots until the onset of WW2. They were made mainly for coal mines, because they were far harder wearing than rubber. Judging by the amount of ingrained black grime on the pair we were given he suspects the pair may have been returned from a coal mine but found to be beyond repair. The hides from which the tops (uppers) were made were around 3/16ths of an inch thick, and it was the task of the CURRIER, Ted Beanland, to apply a dressing of dubbin to the tanned hide, over a period of several days, to make it strong flexible and waterproof. Once cured the various shapes of the component parts of the boot were cut from the hides using metal templates. The parts were then passed to the CLOSER to be hand sewn together (closed) with waxed hemp cords affixed to hog bristles. The closer at Beanlands was John Clayton who left to become the caretaker at St Thomas School, and it was John who was called upon to close the last pair of sea-boots made in 1957. The seams were largely butted together, not overlapped, and were constructed inside out. Once closed the uppers had to be turned right way out and this was done in a gallows by attaching a sacrificial tab purposefully left at the toe end to a hook, and attaching the pull-on tabs at the tops of the boot to a rope which went through a block and down to a hand winch. Once turned the toe-end tab was then trimmed off. The tops were then passed to Angus Bayes who finished the process by attaching the soles and heels first by 5/8th x 1/8th inch brass rivets, followed by hand sewing of the welts. Every pair, when finished, would be filled with water to check for leaks before being stamped with a company stamp and date. With proper care and maintenance they would last up to 20 years. Boots were still coming back for repair well into the 1960s. Once the foreman at Beanlands, Angus Bayes, retired then so too did the skill of repairing them. 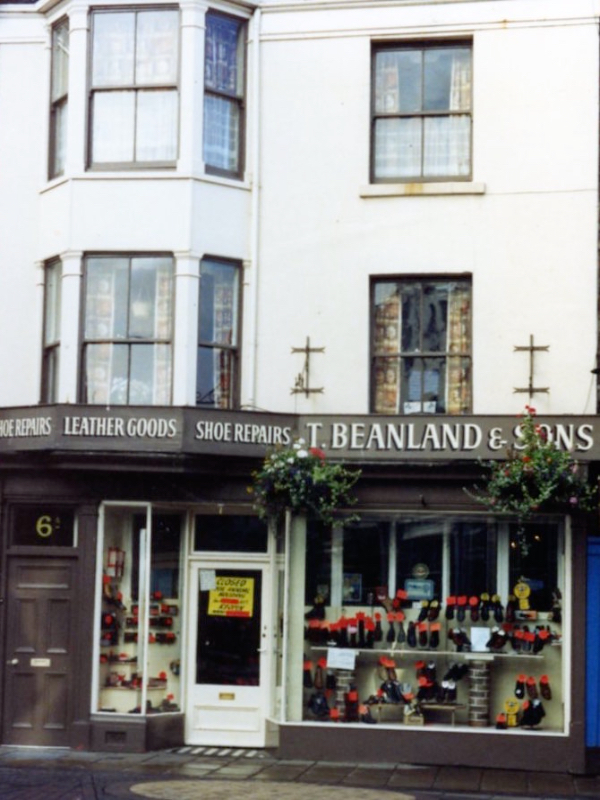 The photographs below show our boots, T. Beanland’s shop in North Street, and one of their original publicity cards giving boot lengths and sizes. 33 inch high boots were 75 shillings, 20 inch high boots were 50 shillings.